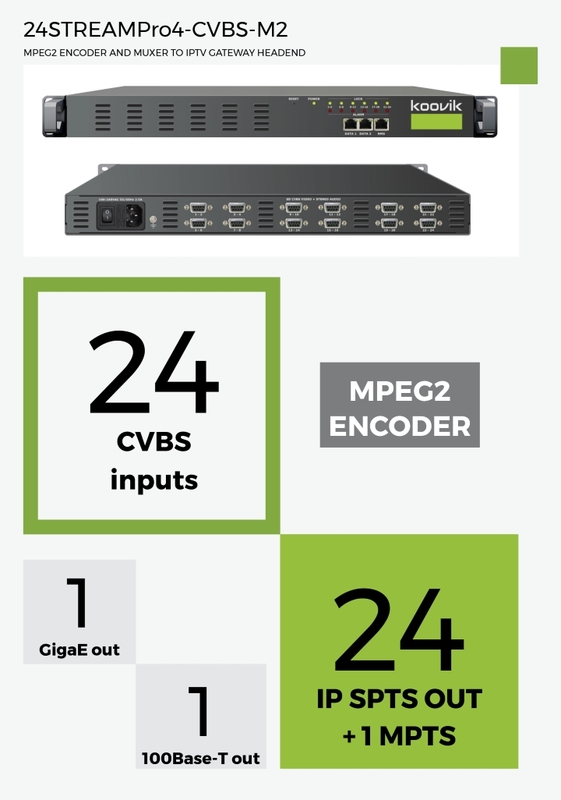 24 CVBS inputs MPEG2 ENCODER and MUXER. IP SPTS and MPTS outputs. ASI output option. multiplexer PID filtering. PSI/SI editing and insertion. IP SPTS 24 SPTS (UDP, RTSP/RTP) output from GE DATA 1 or GE DATA 2. UDP or RTP/RTSP. Unicast or Multicast. IP MPTS 1 MPTS with 24 x CVBS TS output from GE DATA 1 or GE DATA 2. over UDP or RTP/RTSP. Unicast or Multicast.